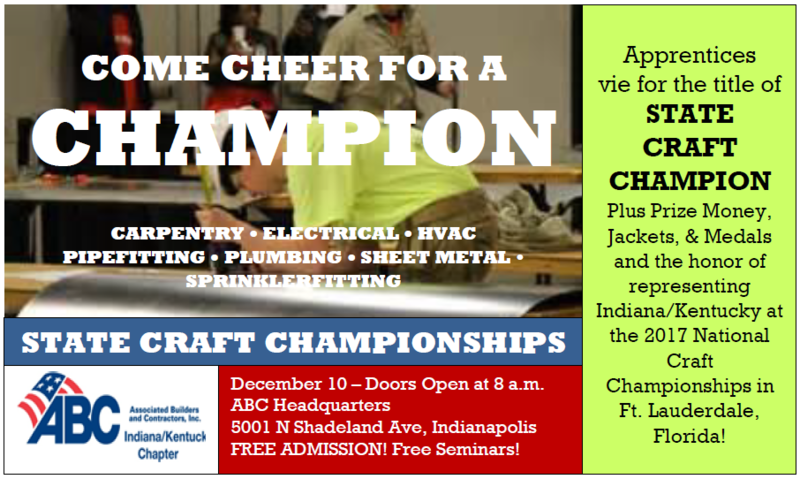 State Craft Championships Coming December 10th! http://www.abcindianakentucky.org/wp-content/uploads/2016/02/New-ABC-indiana-logo-with-glow-300x96.png 0 0 Admin_ABC http://www.abcindianakentucky.org/wp-content/uploads/2016/02/New-ABC-indiana-logo-with-glow-300x96.png Admin_ABC2016-10-25 22:01:102016-10-25 22:01:10State Craft Championships Coming December 10th! [Indianapolis, Indiana] Associated Builders and Contractors of Indiana/Kentucky (ABC) hosted their annual Merit Shop Construction Awards Gala at the Scottish Rite Cathedral. The purpose of the Merit Shop Construction Awards Gala is to recognize Excellence in Merit Shop Construction. Members from across the chapter submit a variety of projects to compete for the esteemed “Award of Excellence” and “Award of Merit.” Those given the “Award of Excellence” are eligible to compete in the ABC National Excellence in Construction competition. This national competition is a great way to give recognition to the incredible work conducted by Indiana/Kentucky members. The event also features the “James W. Rabold Award of Safety Excellence,” given to exemplary safety leaders in the chapter and the “S. Douglas Trolson Image Award,” presented to members for their involvement in ABC and in the construction industry as a whole. This year’s event featured Ben Davis High School J-ROTC for the presentation of the colors and Joanna Reinhardt who sang the national anthem. The ceremony recognized 31 winning projects- presenting over 79 Awards of Excellence and 20 Awards of Merit to those involved on those projects. For the first time ever, ABC had a winner from every council in the chapter! This is a big milestone for us and we are very grateful for everyone’s participation and interest. The Presidential Sponsor, BKD, LLP awarded Holladay Construction with the prestigious Presidential Award, given to an Award of Excellence recipient for the positive community impact of a project. James (Jim) Rabold presented his award to four outstanding members, and J.R. Gaylor presented two members with the S. Douglas Trolson award. Details on the winning projects can be found in the Indianapolis Business Journal, coming the week of October 12, 2016. For those winning projects outside of the Indianapolis area, ABC is working with news outlets local to those winners to ensure your achievements are celebrated. ABC is very proud of chapter’s performance in this year’s event. Associated Builders and Contractors (ABC) is a national construction industry trade association representing nearly 21,000 chapter members. Founded on the merit shop philosophy, ABC and its 70 chapters help members develop people, win work and deliver that work safely, ethically, profitably and for the betterment of the communities in which ABC and its members work. Visit us at www.abcindianakentucky.org.